Welcome to Goat Joy! 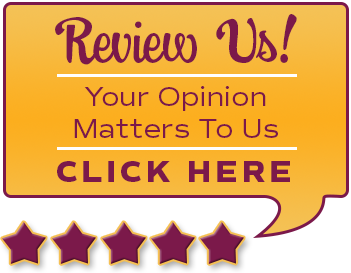 We can think of no better way to describe this experience being offered to you than our name: Goat Joy! The goats bring us joy and we are sharing them with you in a fun, exciting format. Being around the goats is so peaceful and calming. They have a way of restoring you. If you take the time to just be with them, you will feel the joy too! We promise it’s worth the visit to come spend some time with our little herd of the sweetest little critters on the planet! 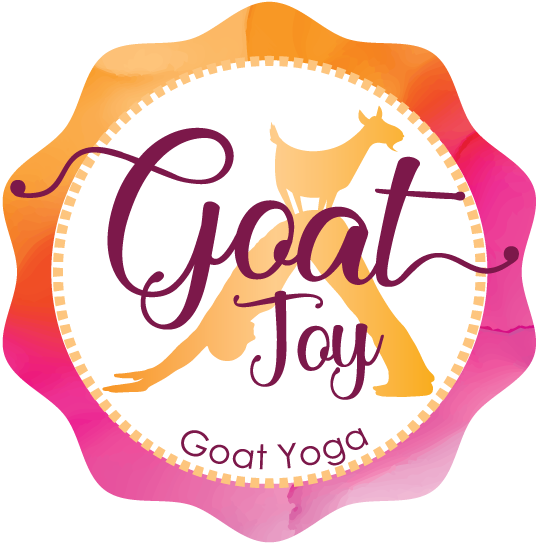 We are offering yoga classes to combine the wonderful health benefits of yoga with the pure joy of being with the amazing, funny, lovable goats to give you a fun relaxing experience. We also offer goat social experiences of several types, geared towards different audiences, click on the tab to explore more. The goats are the star of the show around here. With a growing herd of around fifteen goats, they easily outnumber the people on the farm. We don’t mind though. Their vibrant personalities make life much brighter. We have a variety of goat breeds ranging in size from large to small. They also vary in age from a few years to only a few weeks old! Get to know a little more about our goats and what they do around the farm. Meet our first goat Sweety and our babies available for adoption! Joy is a state of mind and an orientation of the heart. It is a settled state of contentment, confidence and hope. It is something or someone that provides a source of happiness. …. There are many ways to define joy. Joy isn’t just a smile or a laugh. Joy is something that is deep within and doesn’t leave quickly. Goat Joy is part of Ritter Family Farms, which really is a family operation. From raising baby goats to goat yoga to running a Grade A Dairy with our goats’ milk, we have our hands full. We wouldn’t have it any other way. We haven’t always been goat people, but our minds were forever changed when Amanda brought home our first goats. 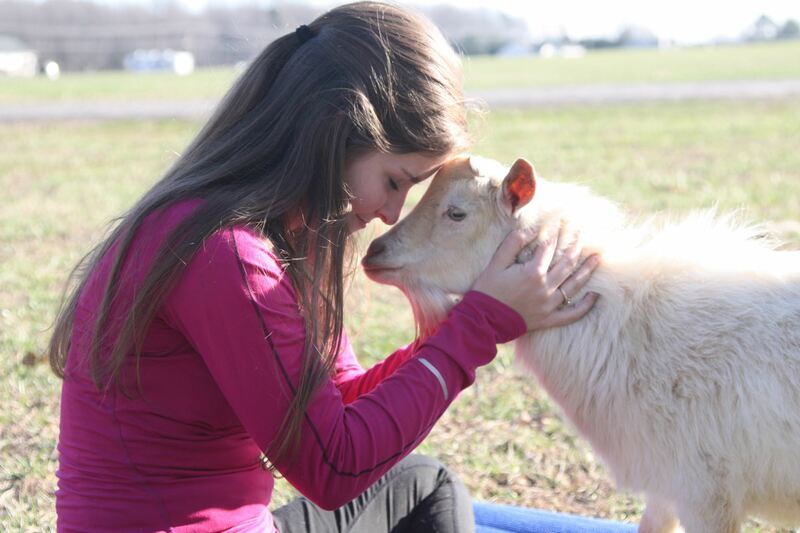 Our main goal with Goat Yoga is to spread our love of goats to others. 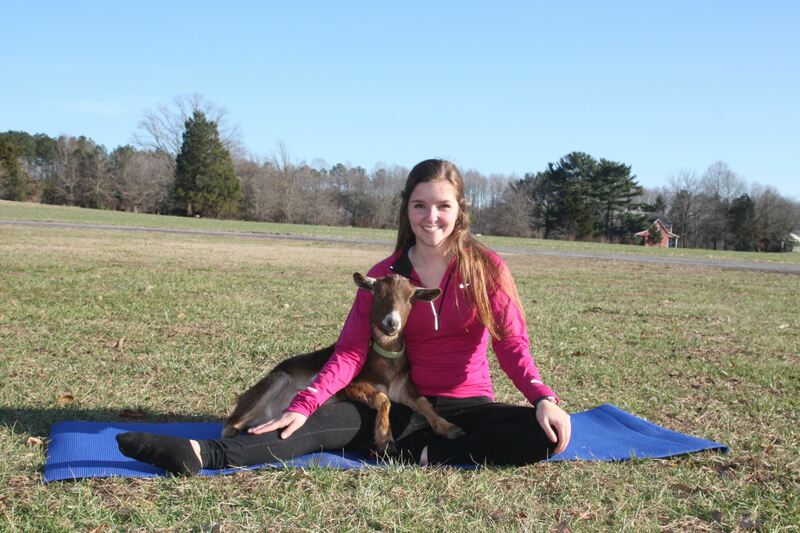 Get to know more about the people behind the goats including our yoga instructors. At Goat Joy, we adore and love our goats! Goat Joy was founded on the idea of sharing this joy with you. We hope that by coming to one of our events, you will feel the same joy and happiness that these sweet little amazing animals bring to us. The benefits of spending time with animals have been well researched and published. Stress relief, lowered blood pressure, relaxation, and mood elevation are just a few of those benefits. Most of that research is based upon domestic pets like dogs and cats. Goats bring an extra element of fun to the equation with their playful antics. It is nearly impossible to not smile and laugh when you are around them. So come, relax and get in touch with your inner goat.